For those who aren’t married, marriage is something which is both exciting and scary. We often get confused with the question: what is the best age to get married. While it depends on the people who are marrying, our Zodiac signs can help us in determining the right time for us to when we should be married. Let’s explore. The ram loves to run and jump around. But hold on. Not all things in life should be done in a hurry. I understand you are always eager to get involved in any kind of action but marriage is a serious issue. So, you need to deal with it in a very pragmatic way. Grow up and reach your 30s before you plunge into your married life. Commitment is a serious issue for you. You always look for long-term relationships. You are extremely calculative and you need stability in your life. In order to attain that stability and commitment, you try to focus on your relationship. It will take you to reach the age of 30 before tying the knot finally with your long-time partner. The twins are always smart in taking decisions but marriage baffles you. So, don’t worry. Relax and take your time. Don’t rush into things. It’s okay for you to get married at 35. You, dear crab of the water sign, really need someone who will give you strength and support. You are extremely vulnerable and need a strong support to sustain yourself. 25 is the right time for you to get married. You can also get married well before that. You have too many things and you come with the tag ‘handle with care.’ You are ambitious, too full of yourself and have a very dominating personality. The lion might have crushes here and there but it will take a lot of time for you to settle down with someone. The late 30s is the right time for you to get married. We all know you are cautious about everything in life. You want things to be absolutely perfect. Marriage is definitely a very crucial issue. But it’s not that hard either. Sometimes, you need to trust in yourself and just take the call. Feel free to get married in the late 20s. You are one of the matured sun signs. You enjoy socializing and lavish weddings. So why don’t you have your own too? 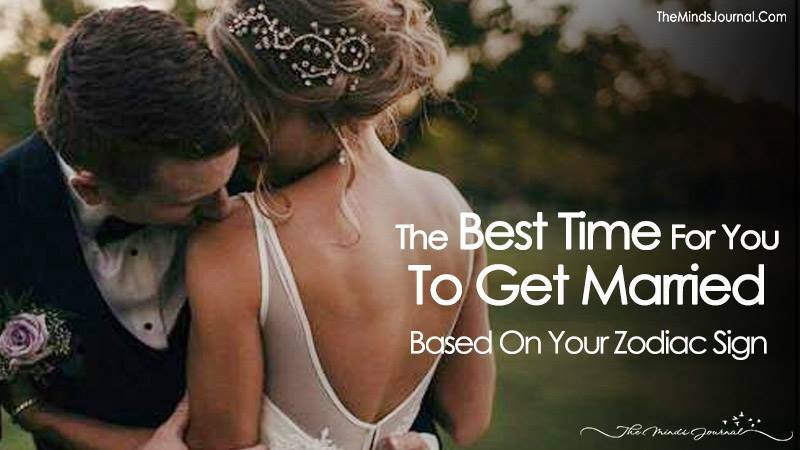 Early or mid-20s is the perfect time for you to get married. You can decide on your own. One of the most immature of the Zodiac signs, you shouldn’t even think of getting married early. You need to grow up yourself. You need to understand that marriage is not about taking the ownership of the life of your partner. First, understand this, then think of taking the call. The 40s is the right time for you to get married. The commitment-phobic one you are, you need time to think about getting married. Yes, we all understand how difficult it is to decide on that one single person with whom you have to spend the rest of your life with. Try exploring the world. You need to come out of your shell sometimes. The ideal time for you to get married is your early 30s.